On the heels of my guide to scotch whisky, I thought I would turn to something a little bit closer to home. While rum may have launched the United States, bourbon and its cousin rye whiskey are the spirits now most closely associated with America. American whiskey production grew out of the settlement of the Ohio River Valley. After independence, white settlers began to move west of the Appalachian Mountains, which had previously been restricted by the British government, eager to keep their colonists close to the coast where they could be more easily taxed. The farmers who grew crops in the extremely fertile region, including lots of corn, rye, and barley, found that it wasn't economically feasible to transport their grain east of the mountains where most of the demand for their products was to be found. However, if those grains were fermented and distilled, the resulting whiskey had a lot more value per pound, meaning that money could be made even after shipping it over the Appalachians. This fueled the almost insatiable appetite for liquor during the 19th century, when the average American drank about five gallons of absolute alcohol in a year (this translates to roughly one 750 mL bottle of 80-proof liquor in a week). These early whiskeys would have been rather rough 'n ready, with thousands of small distilleries producing spirits from whatever grains were cheapest at the time. Most would have been using small copper pot stills and without the tools to precisely measure alcohol concentration, relying on experience and guesswork to judge when to make cuts. That meant significant amounts of unpleasant compounds from the heads and tails of a run would have made it into the hearts cut. Batch variation would have been significant - without purified yeasts to inoculate the wort and less rigorous decontamination of their equipment, wild yeasts and bacteria would often infect the mash, producing all sorts of peculiar compounds. Direct fired stills making for uneven heating of the wort, producing another set of potentially off compounds. Barrel aging would have been more often than not incidental, a product of shipment rather than planning. Which is all to say that these whiskeys would have been very different from the mellow and refined spirits we know and love today. Now there are very tight regulations about how bourbon and rye whiskeys must be produced if the distillers want to label them as 'straight' bourbon or rye whiskey. First, bourbon must be made from a mash of between 51 and 80% corn, with the balance being made up with rye or wheat (the flavoring grain) and malted barley (the enzymes in malt convert starches from the other grains into fermentable sugars). Distillation must be to no more than 160-proof (80% alcohol) and the distillate must be diluted to no more than 125-proof (62.5% alcohol) for aging in new charred oak barrels. At that point it can be called bourbon whiskey. To gain the 'straight' moniker, the bourbon must be aged for at least two years. Bottling, whether straight bourbon or not, must be at least 80-proof (40% alcohol). American rye whiskey conforms to the same requirements, except that the mash must contain at least 51% rye, with the balance being made up with corn and malted barley. The main axis for understanding bourbon and rye whiskey is the percentage of rye in the mash bill. Rye both adds spiciness to whiskey and covers up some of the inherent sweetness from the corn. Just outside the spectrum are wheated bourbons, which use wheat as a flavoring grain instead of rye. This makes for a much softer bourbon, without the chili pepper burn found in most rye recipe bourbons. The most well-known wheated bourbon is Maker's Mark, but I generally prefer Weller bourbons. At the beginning of the rye recipe bourbon spectrum, go for something like Buffalo Trace with 8% rye in its mash bill. Rye flavors will be present, but tend to give way to corn sweetness. In the mid range, Wild Turkey, Ezra Brooks, and Evan Williams bourbons are all made from a 13% rye mash bill and most of Jim Beam's whiskeys are made with a 15% rye mash bill. Here rye becomes a more significant presence, but is still in balance with the corn. Above this, we enter what is generally thought of as 'high rye' territory. Four Roses uses two different 'high rye' mash bills, one at 20% and another at a whopping 35% (the latter is the source for Bulleit bourbon). Jim Beam maintains a legacy 30% rye mash bill for their Old Grand Dad and Basil Hayden expressions. In those whiskeys, rye will be more more prominent, making the bourbon both more spicy and less sweet. From there exists a bit of a gap until you hit rye whiskeys. At 51% rye in the mash bill, Jim Beam (and their Old Overholt label) Rye and Sazerac 6 Year are just over the legal line. So while these are definitely rye whiskeys, with all the spicy herbal flavors that implies, they also retains a fair amount of corn sweetness, making them a good bridge between the two styles of whiskey. From there, it's a jump to whiskeys made with 65% rye in their mash bills - Rittenhouse, Wild Turkey, and Russell's Reserve. These are very spicy and much drier than bourbon. Finally, LDI/MGP uses a 95% rye mash bill for whiskey that is now released by a wide range of independent bottlers from Bulleit to Willett to Templeton to Redemption to George Dickel (if it's a new rye whiskey brand, then it's probably from LDI/MGP - they're the only distiller with spare rye capacity). To get above that, you'll have to turn to Canada - Alberta Distillers makes a 100% rye mash bill whisky. While usually blended into Canadian whiskies, it is also sold as Alberta Premium and now bottled by a number of American independent bottlers, ranging from Jefferson's to Masterson's and Whistle Pig. The other axis to look at is age. Because bourbon and rye are aged in new charred oak barrels, they soak up flavor very quickly. This means that even a year or two can make a significant difference in flavors. It's best to keep the mash bill of the whiskeys you're comparing the same or similar to remove that variable from the equation. Many distillers offer whiskeys from the same mash bill at different ages, such as Buffalo Trace (~4-5 years old) and Eagle Rare (10 years old) or Wild Turkey (6-8 years old) and Russell's Reserve (10 years old) or Weller Special Reserve (~7 years old) and Weller 12 Year. Older whiskeys will tend to be more oaky and tannic, but also with more caramel and toffee flavors. While this feels like a lot of information, hopefully it gives you a few places to start or expand your exploration of American whiskeys. Bourbon and rye are fantastic choices these days because there are still so many great whiskeys available for under $30, making it a very economical way to drink well. 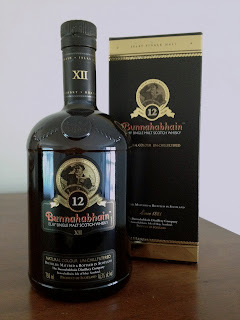 As I mentioned in my review of Bunnahabhain 12 Year, the distillery did a run of 38 PPM heavily peated malt back in 1997. After slumbering for about a dozen years in an ex-bourbon barrel, Mark Reyner's independent bottling company Murray McDavid snapped up a cask and transferred it to an ex-wine barrel from Chateau Lafite Rothschild in what they call Additional Cask Enhancement (ACE). With an outrun of 1200 bottles, I'm pretty sure this must be a multicask release (a Bordeaux barrel is usually 225 liters, which is about 375 750 mL bottles of whisky diluted from 57% to 46%). I'm sad to say that I got one of the last bottles from The Party Source (and I am so, so glad I took a risk on this one), so you're probably out of luck unless you can get it from Mission Liquors. This is, in my opinion, a simply magnificent whisky. ACEing gets derided as too often being used to gussy up lousy casks or overwhelming the underlying malt whisky, but this one works out perfectly. The sweet wine cask flavors are a great compliment to the strong peat flavors, which are also mellowed by the ex-bourbon cask vanilla. The quality of the peat is particularly interesting, as it's ashier than, say, Caol Ila or Lagavulin, reminding me much more of Kilchoman Machir Bay. If this is what Kilchoman's whisky is going to taste like after more than a decade under its belt, then I foresee great things for the distillery. In the meantime, I'm going to try to track down more bottlings of 1997 peated Bunnahabhain, because this is easily one of my favorite whiskies right now. This is, as Tiare puts it, potentially a gross abomination: a mai-tai whose main constituent is Italian amaro rather than rum. This drink comes from the wild mind of Jeremy Oertel of Dram in Brooklyn. 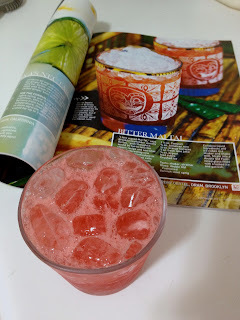 It was featured in Imbibe's article about tiki drinks from a few years back, which is how I found out about it while flipping through back issues yesterday looking for Tiki Month fodder. Combine all ingredients, shake with ice, then either pour unstrained into a chilled rocks glass or strain into a rocks glass full of crushed ice. The nose is light, with hints of the Jamaican rum's dunder funk and the bright bitter notes of Campari, with just a bit of nuttiness from the orgeat and sourness from the lime. The sip begins smoothly and sweetly, with a mixture of orange liqueur and orgeat. As it moves back, Jamaican rum and Campari hit with a one-two punch, fading out with bitter/sweet/sour notes of lime and Campari. Kind of like the Stormy Mai-Tai, it, just doesn't look like it's going to work. While wacky on its face, this drink comes together beautifully. It's possible that it would have been too sweet if I hadn't gone for a big Jamaican rum like Smith & Cross. But the rum needs to be bold to punch through all of the other strong flavors in the drink. 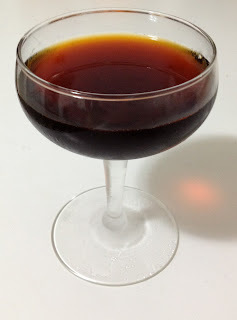 If you want to take it in a darker direction, Coruba and a dash of Angostura bitters might not be a bad tack to take. However, I think it's going to be delicious no matter how you choose to make it. 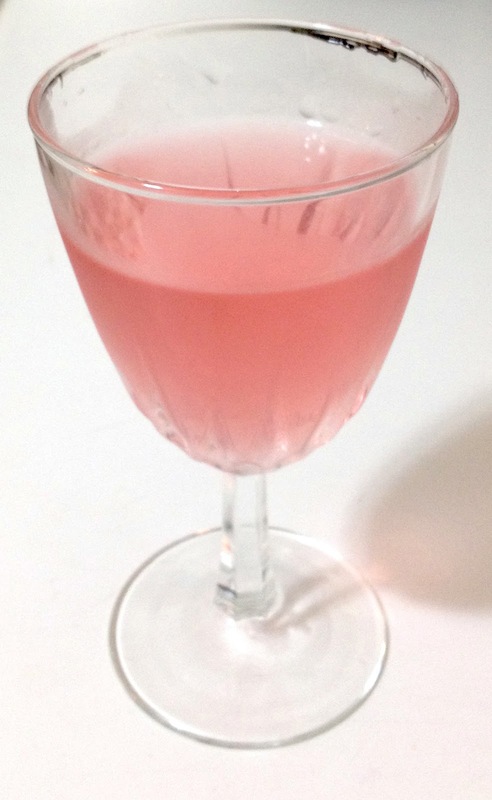 This drink comes from the PDT Cocktail Book, as a variation on the Chancellor cocktail from Esquire. I swapped around the exact varieties of spirits to suit what I had on hand, but I think it turned out reasonably well. 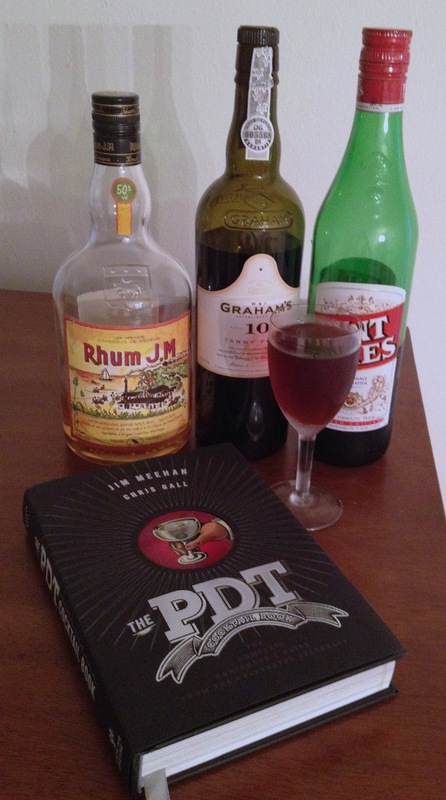 The nose is dominated by the rhum, though inflected with sweet grape notes from the port and vermouth. The sip begins with very mild sweetness, which grows a bit towards mid-palate. Further back there's a complex interplay of various bitter notes and grape/brandy flavors. The finish is mostly bitter, between the vermouth and bitters, with just a bit of vanilla. This is a really interesting drink to me because it's highlighting rhum agricole in a cocktail that's not a tiki drink. Sort of like scotch, it can be a difficult ingredient to work with because it doesn't always play well with others. However, using a more mellow VSOP rhum will probably come out smoother than the more fiery Rhum J.M. ESB that I picked. Either way, I think this is a really nice twist on the standard Manhattan mold. Tucked away in the northeast corner of the island of Islay, Bunnahabhain has been cranking out that rarest sort of Islay whisky - unpeated single malts - since 1883. 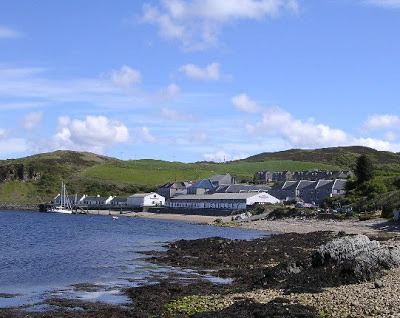 The distillery is just up the road from another remote Islay distillery, Caol Ila. While seemingly inaccessible these days, when they were constructed in the 19th century it was a very reasonable location, as most goods were shipped by water rather than road. Bunnahabhain was built on a nice harbor that is sheltered from the fierce Atlantic winds that buffet the other side of the island, which meant that the distillery could bring in malt and ship out whisky via their own pier. Additionally, the distillery had a good water source in the form of the Margadale spring, which was piped down from the surrounding hills directly to the distillery. Construction of Bunnahabhain began in 1881 (the same year as another Islay distillery, Bruichladdich) during the late 19th century whisky boom, with production beginning two years later. Founded to provide malt whisky for the burgeoning blended whisky trade, it sought to emulate the success of Caol Ila, which had been built several decades beforehand. Coincidentally, Bunnahabhain also spent most of its first century producing peated malt whisky, with the peat coming from the nearby Margadale Hill. It was only in 1963, during a major expansion of the distillery, that they switched to producing almost exclusively the unpeated malt whisky that they are now known for. Since then there have been experimental runs of 28 PPM malt in 1991 and 38 PPM malt in 1997, with more regular distillation of 38 PPM malt beginning in 2003. That expansion also provided Bunnahabhain with the largest potentially capacity of any distiller on the island. They are currently topped by Caol Ila only because the distillery is not being run at full capacity. Most recently, Bunnahabhain passed from the ownership of the Edrington group (owners of Macallan and Highland Park) to Burn Stewart (owners of the Tobermory and Deanston scotch whisky distilleries, as well as Angostura bitters, Belvedere vodka and Thomas Hine cognac). The latest owners have brought about some major changes at Bunnahabhain, mostly notably the reformatting of their whiskies to be bottled at at least 46.3% ABV and without chill filtration. This has earned them plaudits from whisky reviewers and helped to raise the profile of the distillery from its former obscurity. Nose: oloroso sherry presence is rich but not overpowering, malted barley, bittersweet fudge and mocha, roasted cacao nibs or coffee beans, walnuts, a hint of woodsmoke, maritime air, fresh fruit esters (pear?). Adding a few drops of water makes the nose a bit more gentle, with a bit of a shift towards the malt component, along with a darker and less sweet sherry note, and something a little bit floral. Taste: begins with gentle malt sugars, then segues into very rich sherry sweetness - properly balanced, followed by mocha bittersweetness, stewed fruit, and black pepper mid-palate, somewhat astringent oak tannins at the back. After dilution, the mouthfeel becomes a bit thicker with more malt sugars, while the pepper, sherry, and oak retreat a bit, shifting the balance. Finish: peppery oak, coffee beans, lingering sherry, stewed fruit, malty vanilla. I've got to say that this has become my new favorite sherry-driven single malt. I originally bought it on a bit of a whim, because I was able to pick up a bottle for the very reasonable price of $45 (it's ~$60 here in Oregon). I'm quite glad that I did, since the contents are just so good. It combines a lot of what I enjoyed about Aberlour 12 with a bit more heft and a distinctly Islay character. Additionally, like Aberlour, I really like what comes out of marrying together bourbon cask and sherry cask matured whiskies, as opposed to a cask finish. The sherry is a strong presence in the final product, but the malt and vanilla from the bourbon cask portion isn't completely obscured, providing a balance that is sometimes lacking in cask finished whiskies. The maritime component also adds some very nice complexity, giving it an edge over the competition. I have heard others complain about it being too oaky and astringent, but for me that's actually a plus. I really like that the overall profile is bittersweet rather than the overriding sweetness that often comes with sherry. But, you know, your mileage may vary. I will happily be drinking this whisky in all its higher proof, non-chill filtered glory. This month's Mixology Monday is hosted by Stuart over at Putney Farm. He wants us to think about the various ways that cocktails can be 'inverted'. Hmm…it appears that the definition is pretty broad. It seems that “inverted” really just means something “flipped on its head”. And that can mean almost anything, and leaves plenty of room for creativity. So we are going with the “inverted” theme. You can invert the ratios of spirits, liqueurs or bitters in a cocktail, but we suggest you go beyond that and “invert” whatever you want. Spirits, name, ingredients, proof, color, geography, garnish and glassware are all fair game. An apéritif made with Navy-Strength booze? Give it a try. A beer-based cocktail that tastes like champagne? Sure. A clear Manhattan? Worth a shot (and good luck with that). The only thing we expect is the unexpected. Have fun." The nose has a very strong grape note from the vermouth and cognac. The bitters and Bénédictine peek out, but have a hard time holding their own. The sip begins rather sweetly, balanced between grapes from the vermouth and herbal sweetness from the Bénédictine. The cognac dominates mid-palate along with some citrus, slowly giving way to the various bitter ingredients. The finish is grape and chocolate. 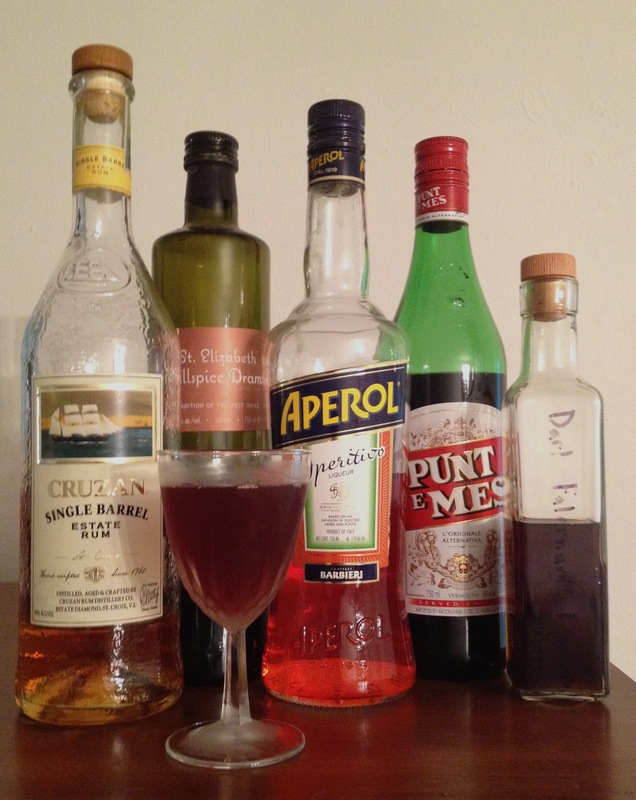 The sweet vermouth becomes the center of gravity for the drink, around which the other ingredients can only orbit. While it's good, I feel like it highlights the logic behind the original. 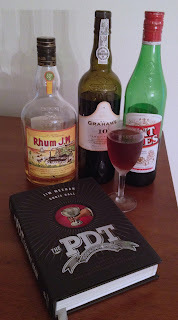 Even using a rather pungent vermouth like Punt e Mes, it still comes off as almost cloying, despite the extra bitters. I think this would actually make a nice aperitif-style drink if you cut the measurements in half and lightened it with soda water (the acidity would also help to neutralize some of the sweetness). 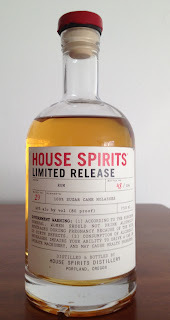 House Spirits is a Portland distillery that was established in 2005. Best known for their Aviation gin, they also put out what used to be known as their Apothecary line - small runs of experimental spirits. This has included everything from ouzo, gammel aquavit, malt whiskey, and rum. This rum was released during the Great American Distiller's Festival in 2011. Made with molasses, the white rum was aged for nine months in ex-Chardonnay wine barrels, then diluted down to 40% ABV for bottling. Nose: toasted oak, peanut butter cookies, graham crackers, molasses, light wine cask influence. After adding a few drops of water the nose becomes drier and a little musty with some buttered toast. Taste: very smooth, creamed brown sugar up front, mild oak, light esters, and pepper mid-palate and back. After dilution it becomes sweeter, but the molasses notes are lighter, with the wine cask finally becoming present. Finish: short, creamy spices, bittersweet molasses, light esters, drying. This rum is a huge improvement on their first versions, which were made with turbinado sugar rather than molasses. There is much more body and depth of flavor. With that said, while this is a significantly better effort, there is still room for improvement. While precise distillation and the wine barrels did a good job of rounding off any rough edges, it doesn't have the kind of complexity I would hope for. If I had my druthers, future efforts would focus on increasing the ester content, either through different yeasts or dunder, in the Jamaican style. That would provide a richer base that could be combined with more active wine casks for something really unique and interesting. I'm just going to hit the highlights here. For a more in-depth beginner's guide, hop over to Malt Madness for the inside scoop. First off, scotch whisky (always without an e) is made in Scotland. The Scotch Whisky Association fights assiduously (successfully and unsuccessfully) to prevent distillers anywhere else in the world from marketing spirits that might be confused with real scotch. So what is it supposed to be? There are two different types of whisky that usually spring to mind when people think of scotch. Single malt whisky gets most of the adulation, with big names like Glenfiddich, Glenlivet, and Macallan. Breaking down the name, it refers to a spirit made from 100% malted (partially germinated to convert starches into sugar, then arrested with heat) barley that is fermented and distilled in a copper pot still at one distillery, then aged in oak barrels for at least three years. Even mixing in a tiny amount of another single malt will transform it into a blended malt, which is a mixture of single malts from different distilleries. The second variety, which is what makes most of the money, is blended whisky. These include whiskies like Johnnie Walker, Dewars, and Chivas. Blended whisky is a mixture of single malt whiskies, usually from many different distilleries, that is combined with grain whisky. This produces lighter and more consistent whiskies that appeal to a broad range of drinkers. Grain whisky is simply any whisky made in Scotland with grains other than malted barley. Additionally, it is usually distilled in column stills rather than pot stills, which gives it a lighter flavor and body. As with malt whisky, grain whisky must be aged for at least three years. And most importantly to the distillers, since grain whisky is cheaper to produce, diluting malt whisky with it to make blends increases margins. From now on I'm mostly going to focus on single malt whiskies, the superstars of the scotch whisky crowd. Beyond the basic requirements, there are all sorts of factors that shape the final flavor of a whisky. These range from the location of the distillery, the source of the barley, the way that it is malted (by hand or in a large malting facility), whether the germinating malt is dried with hot air or burning peat, the type of yeast used, the length of time that it is fermented, how full the still is, how quickly it is distilled, the shape (distillers will sometimes try to have every bump and dent in a still replicated when they have new ones made) and configuration of the still (does the lyne arm rise or drop? does it have a purifier? 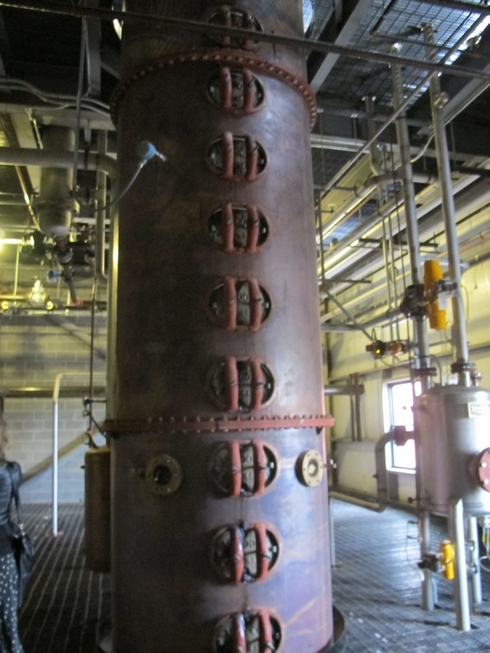 ), the type of condenser, where the cuts are made (foreshots, heart, and feints), how much the raw spirit is diluted before barreling, what type of barrel is used (ex-bourbon, ex-sherry, ex-port, other spirit or wine), how many times that barrel has been used before (virgin, first fill, second fill, etc), how long the whisky is aged, where it is aged (some whisky is aged on site, while others are trucked to centralized warehouses), to how much the whisky is diluted for bottling. Which is to say that there are a lot of different things going on, so we'll start with a few. In my opinion, the best place to start with single malts is Glenmorangie Original. I originally picked it up on John Hansell's recommendation - he rates it as one of the best whiskies on the market today, which is no small thing given the breadth and depth of his experience. Personally, I think it's a great place to start for a number of other reasons. 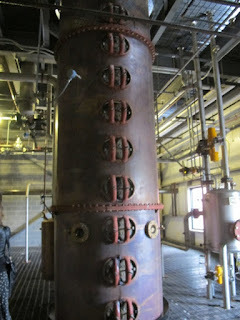 First, Glenmorangie uses very tall stills, which produces a fairly light spirit. This means that Original is not overly aggressive, while retaining good flavor density. Secondly, the spirit is aged entirely in ex-bourbon barrels for ten years, which both help to give it an approachable set of flavors and mean that it is uncomplicated by the various types of wine finishes available to distillers these days. It's relatively simple - there isn't a vast array of flavors to pick out of it - but what's there is very good. As an added bonus, it provides a stepping stone to investigating Glenmorangie's cask finished whiskies - these include sherry, port, and sauternes. These cask finished whiskies begin their lives in the same way as the Original, aged for ten years in ex-bourbon barrels, before being re-casked for an additional two years. This means that they are fairly comparable - they're all built on the same foundation, so you can look for differences to understand what the various casks do to the whisky. These can be picked up inexpensively either by grabbing one of Glenmorangie's Discovery packs, which includes a full bottle of the Original alongside three miniature bottles of their cask finished whiskies, or the Glenmorangie Collection, which has four 100 mL bottles of the Original and the various cask finished whiskies. Either of these should be under $40. So where to go from that beginning? There are a number of different axes to explore. Probably the most important is the different ways that sherry can be introduced into whisky. Sherry was historically sold by Scottish merchants who imported casks of fortified wines from the Continent to make the rough local malt whisky more palatable by aging it in the empty wine casks after selling their original contents. There are a number of different strategies for aging scotch whisky in ex-sherry casks. One, as mentioned above, is cask finishing, where whisky that was previously matured in ex-bourbon casks is transferred to ex-sherry casks to absorb some of their flavor. Glenmorangie's Lasanta is one example, along with Balvenie Doublewood. Alternatively, whisky from ex-bourbon and ex-sherry casks can be married together. This is the method distilleries like Aberlour, Bunnahabhain, Bruichladdich, and Arran use for their standard expressions. Last, but not least, whisky can be aged in ex-sherry casks from day one. This method is used by distilleries like Macallan, Glenfarclas, and GlenDronach. Any one of these would be a fine place to start your exploration. The second major factor is peat. Both maligned and loved, peat originally found its way into scotch whisky because Scotland doesn't have enough trees. It does, however, have a lot of peat. And peat could be burned to provide the heat to arrest the germination of malted barley, preparing it for fermentation. During the 19th century, coal became more readily available, so peat slowly shifted towards being something that was used to produce a particular character in the whisky, instead of being a necessity. While peat is most closely associated with whiskies produced on the island of Islay, peated whiskies are currently being produced in almost every corner of the country. While the smoky, vegetal flavors of peat aren't to everyone's liking, there are ways to dip your toe in the pool without jumping straight to notorious heavyweights like Laphroaig or Ardbeg. 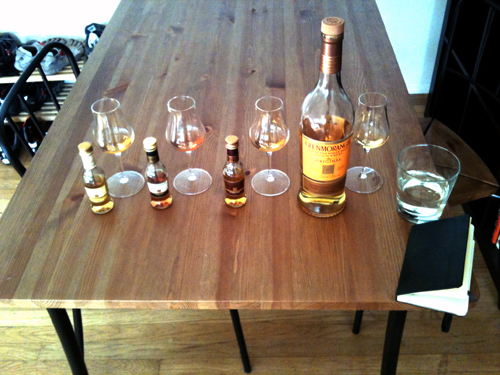 A good place to start would be something like Clynelish 14 or Highland Park 12. Both start off with about 1/2 to 1/3 the amount of peaty compounds found in the Islay bruisers. This means that there is some smoke, but it doesn't overpower the other elements of the malt. Stepping up a notch, check out Springbank 10, Bowmore 12, Talisker 10 or Caol Ila 12. All of these are 'moderatedly peated', with about 50-60% of the intensity of the big boys. However, if you really want to go all out, Ardbeg 10, Laphroaig 10, BenRiach Curiositas, or Longrow CV might tickle your fancy. While the peat wars have raised the maximum, these are all still very firmly in the peaty camp, almost billowing with smoke. Hopefully all of this hasn't been too overwhelming. There are many more features to explore, but these should give you some places to begin you're journey. It's an amazing place given that everything begins with some partially sprouted grain, but from those humble begins scotch can take on an almost infinite variety of flavors. This is the second in my set of reviews looking at rhums from the Saint James distillery on Martinique. Saint James is the oldest distillery on the island in continuous operation. While rhum production goes back even further, the brand came out of a decision by Louis XV in 1763 to allow rhum from the island to be exported. The Saint James brand was established in 1765 near the town of Saint Pierre, with the name designed to appeal to English-speaking colonists in New England. Saint James is also distinguished by having put out the first vintage rhum on the island in 1885, which has continued ever since. Disaster struck in 1902 when Mount Pelée erupted, destroying Saint Pierre and most of the distillery's building. However, the main house largely survived. The distillery was consolidated on the other side of the island in the town of Saint Marie in 1974, where production has been located ever since. The sugar cane harvest for Saint James begins in February and extends into summer. The cut cane is transported to the distillery as quickly as possible, where it is pressed in mills to extract the juice. The juice, or 'vessou', ferments naturally due to the yeast present in the cane. Fermentation is kept between 25-30º C and is fairly quick, taking only a day or two. 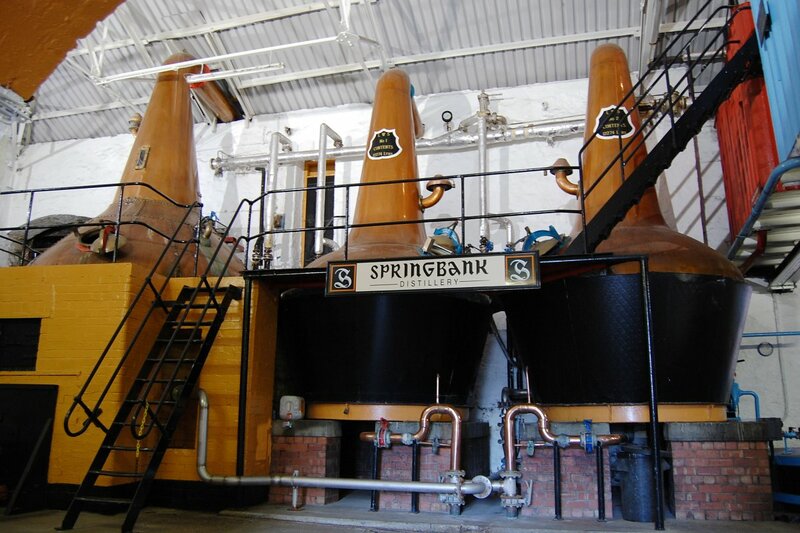 The mash is at 4-5% alcohol when it is added to the column stills, which give a raw spirit of 65-74% alcohol. The fresh rhum is then either rested in steel vats for a few months to produce blanc rhum or aged in oak barrels to produce everything from their paille rhum to rhum vieux. Saint James has a fairly high angels share of 8% a year, which goes a long way towards explaining their prices. Nose: bittersweet oak, subdued berries and wine, balsamic vinegar or raspberries, mesquite honey, a hint of woodsmoke, creamy beeswax, salted caramels, dry cane, becoming more floral/berry-oriented with time. After adding a few drops of water, the oak and wine flavors become more integrated, the berry notes seem fresher, and some brown sugar bacon notes emerge. Taste: oak throughout, cane and wood sugar up front with wine and berries, caramel/burned sugar mid-palate along with light orange peel and vanilla, a big blast of pepper, which becomes creamier with brandy near the back. After dilution, the flavors are thinner but creamier, with the pepper becoming more assertive and the addition of some mocha near the back. The Hors d'Âge expression is one of the older rhums that Saint James puts out. The rhum is aged for six to ten years in 180-liter casks, then bottled at 43% alcohol. Unsurprisingly, this means that the wood influence is much more obvious in this rhum compared to the Royal Ambré. While this does round off some of the rougher edges found in Royal Ambré, the wood can seem rather heavy on the nose at first, taking some time in the glass to find a proper balance. I feel like this rhum occupies a middle ground between the berry emphasis of Neisson Réserve Spéciale and the woodier bacon notes of La Favorite Vieux. I was slightly disappointed by how much it lost on the nose with even a few drops of water, but the palate was more robust. Sadly this rhum is getting harder to find. I've heard rumors that Saint James was pulling out of U.S. distribution, but it can still be found with a bit of work (Hi-Time Wine has the full spread available in the U.S.). MSRP is around $50, which is a rather reasonable price for the quality of this spirit. This offers just as much complexity and depth as similarly priced single malts, so I would recommend Hors d'Âge without reservation. I've reviewed other rums from El Dorado before, but this one is a bit different. El Dorado 3 Year is, like all their rums, produced in Guyana from their amazing collection of stills. ED3 is a blend of rums distilled in two different four-column Savalle stills, Skeldon and Blairmont, then aged in ex-bourbon casks for at least three years. The trick with this rum is that the color is stripped out by double charcoal filtration. While that also removes some of the flavor, ED3 is still more flavorful than most white rums you will find on the market these days. Bottling proof is, like most rums, at 40%. Taste: lemon/orange peel and cane sugar sweetness up front - which continues through the sip - becomes bittersweet mid-palate, slightly tannic, tropical fruit and berries, a hint of cacao and bitter molasses at the back. The nose is a delicate melange of the vermouth's aromatics, some floral notes, orange peel, raspberry, and rum. The sip begins fairly neutrally, with depth building as the drink progresses across the tongue. Mild sweetness comes in first, with vanilla and orange, then trends a bit more bitter as the vermouth takes over, supplemented by the rum. The finish is pure dry cacao. The history of this drink is debated, but the established facts are that it was created in Cuba around the time of Prohibition, when numerous Americans would sail to the island for a drinking vacation. I can see why it was such a smash - the drink is simultaneously ethereal and hard-hitting. While containing naught but booze, but it still manages to sneak up on you. It's fruity, but not overly so. Sweet, but not overly so. Bitter, but not overly so. Everything is in perfect tension. And the choice of rum feels spot-on for this drink. In a daiquiri, ED3 produces a fairly delicate nose, with gentle vanilla and a hint of lime. The vanilla comes in sweetly at the beginning of the sip and carries through. Lime hits mid-palate, giving the drink crispness. Near the back, the sweetness fades a bit towards light bitterness and becomes more rounded, with rummy depth. Overall, I would say this is an exceptional daiquiri - every element hitting with supreme poise. I don't know how much of a wrap-up I need. Go buy this rum. Right now. Pierre Ferrand is both a very old and a relatively new company. Old, in the sense that the history of Pierre Ferrand stretches back to the late 18th century. New, in the sense that the company was revived in the late 1980s by Alexandre Gabriel, who formed Cognac Ferrand. The company now also produces its own gin, as well as sourcing and aging rums and other spirits. Located in the heart of the Grand Champagne region - considered one of the best areas for making cognac because its very chalky soils help to retain moisture that keeps the grapes healthy during the long, dry summer months. All of their cognac is double distilled in a small 25 hectoliter alembic still from wine on the lees (the solids are not filtered out before loading the still, which means that flavors are also extracted from the lees). Aging is done, as with all cognac, in limousin oak. A variety of different toasting levels are used in the barrels, which will change the types of compounds extracted by the spirit. The distillery has over half a dozen different locations for aging, all with different ranges of humidity and temperature. All of these give Pierre Ferrand a wide selection of eau de vie to select for blending into their standard expressions. Their Reserve expression is in the middle of their range, above the younger Ambre expression and below the older Esprit des Dieux. While there's no age statement on it, the number I've seen most often is 20 years old. However, I haven't been able to get anything official and there are conflicting statements about whether that's the average age or the maximum age of the eau de vie going into the blend. Either way, it's definitely mature. Nose: baked spiced and green apples, ripe berries, light floral and honey notes, slightly musty/vegetal, purple/cherry cough syrup, sweet grapes. After dilution, the nose becomes more oily (nut oils? ), the cherry notes become more woody, some grassy notes emerge alongside some sweet and salty barbecue. Taste: up front is lemon and orange peel alongside cane sugar sweetness - both of which continue through the palate, mild oak and pepper aren't far behind, which introduce some bitterness along with mineral notes and hints of grape skins. After dilution, the sweetness is more subdued, with strong pepper that overlaps with the fruit flavors. Finish: vegetal, musty, bittersweet oak, green apples, grapes, and pepper. I really enjoy the balance of this cognac. While there is certainly plenty of sweet fruit flavors to go around, the palate is balanced by pepper and bittersweet oak that keep it from going off the rails. The freshness of the flavors is also a pleasant surprise from a spirit with so much age on it. As a value proposition, I'd say this is a pretty good choice. I was very, very lucky and snagged my bottle for under $40 (the OLCC does some peculiar things). Normally it's more around $70, which isn't cheap, but doesn't seem absurd for a spirit of this quality. I need to try the younger Ambre expression to get a sense of how it compares, as that one is usually around $40. However, if I'm ever able to find a bottle of the Reserve for under $60, I will jump right on it. It's just so nice that I couldn't say no. In case you're not already in the know, it's Tiki Month over at the Pegu Blog. While not your normal kind of tiki, this variation on the Kingston Negroni supplements it with a very tropical combination of ingredients like falernum, Don's Spices, and Angostura bitters. A dressed up tiki, if you will. The nose is full of spice and bitterness, rounded by healthy doses of vanilla and caramel. The sip begins smoothly, with sweetness and bitter spices growing in tandem, riding over a bed of rum. The bitter notes finally begin to dominate on the finish, with the Angostura bitters and falernum getting the upper hand.